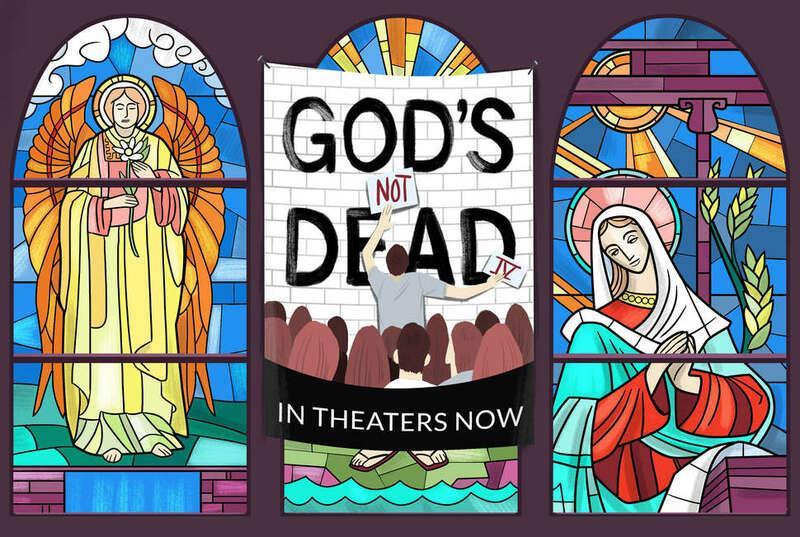 With God's Not Dead 3: A Light in Darkness hitting theaters this month, we're re-upping this introspective, relevant report from our archives. It's a frustrating time to love movies and God. As a lifelong evangelical and a Christian film critic, I'm constantly alerted to the next faith-based movie. You know, your near-death experience drama, your Kirk Cameron vehicles, your God's Not Dead franchise (see "part two" in theaters this week!) -- "Christian" films. Which, for someone who turns to movies for a dose of culture, often look like a pile of cheap cash-ins that make me break out in hives. Hollywood's definition of the "faith audience" boils down to churchgoers, often Evangelical Protestants, well enough off to afford a night at the movies, interested in inspirational Biblical adaptations and movies about heaven, family, and genial, good neighbors, and highly critical of any sexuality or bad language. If you're not devout, you probably miss these movies entirely. But they're a big business: in the last three years, low-budget Christian-themed films have earned over $445 million at the US box office. A lot of these are basically well-intentioned kitsch, innocuous in the manner of a lousy conventional rom-com or inept indie drama. But they can be worse than that. I can excuse (or ignore) a poorly made movie. But some of the most popular faith-based movies today aren't just sub-par entertainment -- they're anti-Christian. 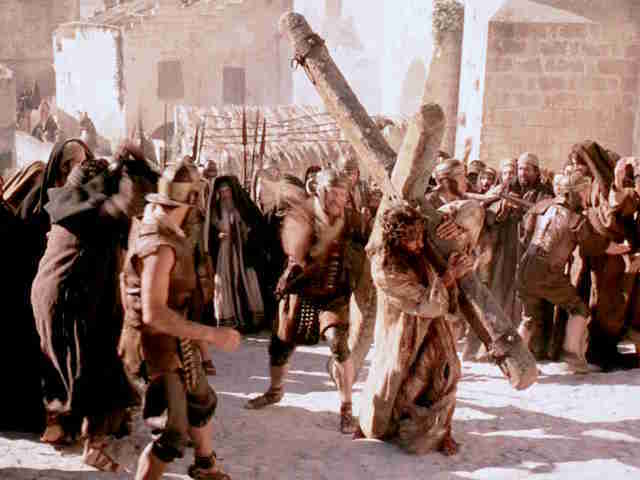 After The Passion of the Christ made more money than anyone dreamed possible -- still the highest-grossing R-rated film of all time in America -- studios frantically tried to corner the faith market by producing movies that enticed churches to buy out theaters. There’s a long history of sword-and-sandal flicks before that, plus occasional apocalyptic movies like A Thief in the Night, and the Billy Graham Evangelistic Association made a number of solid films a few decades ago that were distributed directly to churches. But 2004 signaled something new, and producers took notice. Maybe someone in Hollywood read a tweet, or ate some Ezekiel bread, but all at once a wave of specific "faith" releases began to crest. The wave crashed in 2014, which saw Son of God (February), God’s Not Dead and Noah (March), Heaven Is for Real (April), Mom's Night Out (May), Persecuted (July), The Song and Believe Me (September), the Left Behind remake starring Nicolas Cage (October), Saving Christmas (November), and Exodus: Gods and Kings (December). As a Christian film critic, I got calls from reporters all over the place, asking whether I could comment on what the "Year of the Bible Film" was all about. It was a thing. Those aren't ephemeral numbers: in addition to the incredible box-office hauls of God's Not Dead and Heaven is for Real, several of the films made money (including Mom's Night Out, which grossed $10 million on a $5 million budget, and Left Behind, which grossed $19.7 millon on $15 million). Son of God was a recut version of ratings juggernaut The Bible, which raked in 10-13 million viewers for the History Channel and led to a second series on NBC, A.D. The Bible Continues. And the trend continued in 2015 with Old Fashioned (competing with Fifty Shades of Grey on Valentine’s Day weekend), Do You Believe (March), War Room (August), the unfortunately titled 90 Minutes in Heaven, the thriller Captive (September), and football movie Woodlawn (October). We're barely a quarter of the way into 2016 and have already weathered The Masked Saint, Risen, The Young Messiah, and Miracles From Heaven. This week we get God's Not Dead 2 -- a missed titling opportunity, if ever there was one -- with a Ben-Hur remake and an adaptation of the popular novel Same Kind of Different as Me on the way. Fact: I am the intended audience for these movies. I've been a Christian all my life, attending evangelical churches, singing in the choir, and helping out at Vacation Bible School. I was homeschooled for religious reasons and grew up in a rural town. 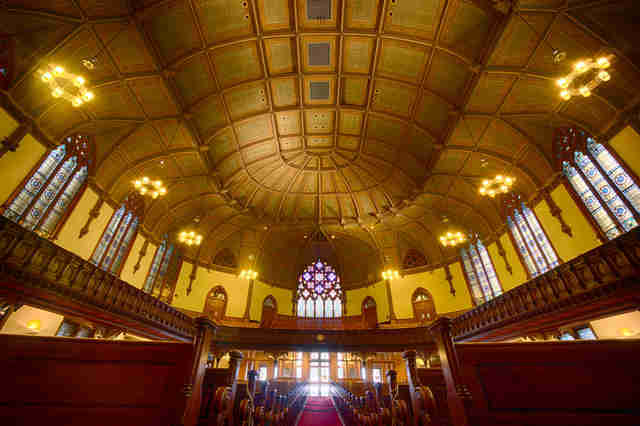 When I moved to Brooklyn, I became a communing member of an Evangelical Presbyterian church. Members of my family belong to a smorgasbord of churches all along the Eastern Seaboard, from Southern Baptist to Assemblies of God to Evangelical Free and Roman Catholic. I'm a film critic for Christianity Today, founded by Southern Baptist icon Billy Graham. I hold a full-time faculty appointment at The King's College, a school founded by a radio preacher in 1938. I now teach undergraduates who were raised in churches across America. I am Christian. I also love good movies and watch and write about them for a living. I care that they're good. And the deluge of Christian movies brought on a deluge of bad reviews. It's practically catechistic among many faith-based devotees and movie producers that mainstream critics pan the films because they "don’t believe in Jesus." The problems run deeper. Jesus is all right; the screenwriters, not so much. As onlookers laugh these movies off, I stand in the Internet's corner, wincing and trying not to rail. I can't just brush it off like others. Christian theology is rich and creative and full of imagination, that's broad enough to take up residence among all kinds of human cultures. It contains within itself the idea that art exists as a good unto itself, not just a utilitarian vehicle for messages. (In the Greek, the Bible calls humans "poems" -- I love that.) There is no reason Christian movies can't take the time to become good art. Each one that fails leaves me furious. It all came to a head with God’s Not Dead, which grossed $60 million on its $2 million budget and essentially launched the faith-based production juggernaut, Pure Flix. It's essentially an adaptation of an Internet meme, in which an atheist professor loses an argument with a lowly undergraduate about the existence of God. At first I avoided the movie, because I thought it would be another shoddy Christian film and I'd already been inundated. I wanted it to go away. I eventually borrowed a copy of the movie from a friend. We all make mistakes. God's Not Dead is a technically proficient film that earns its title from both misreading Nietzsche and finding inspiration in the Newsboys, a Christian band I listened to in high school who feature heavily in the film. By the end I was actively offended. Not just because it suggests that it’s somehow appropriate for a first-semester college freshman to engage in a pitched battle with an evil, sadistic philosophy professor played by Kevin Sorbo. Nor because it takes the theologically weird stance that standing for truth and living your faith -- "the assurance of things hoped for, the conviction of things not seen," says Hebrews 1:1 -- means that science, mysterious car engine fixes, and heartfelt anecdotes can prove that God is "alive," an inherently unprovable thing. The glaring problem with God’s Not Dead, and most other films made for and marketed at the "faith audience," is that instead of exercising and challenging the imagination of their audience in ways that would make their audience better Christians, they shut down imagination and whisper sweet nothings into their ears instead. I can look past characters created by writers who have only heard about liberals and secularists on talk radio. But every non-Christian character in the movie, and so many others, "hates God" (direct quote). They believe or hope the Almighty has kicked the can, and do so for deeply personal reasons. They're all secretly miserable, every last one. I believe in the power of representation enough to know that God's Not Dead insidiously shapes the imaginations of the audience, especially if their daily lives don't bring them into contact with people who don't believe the way they do. And that's true for many (and not just Christians). Rarely do I even recognize myself or my family and friends in Christian movie characters. Left Behind, a faith-based film in which virtually all the Christian characters are weirdly portrayed as nutjobs, is a great example. And the God-fearing characters in God's Not Dead seem like decent people, even if Duck Dynasty's Willie and Korie Robertson co-star in a dash of ill-conceived product placement. But I believe we're all in the same strange family of misfits. Which is why I get twitchy with the "faith audience" designation. The implication is that, if you're not in that audience, you're... what? The doubt audience? The unbelief audience? God’s Not Dead encourages its audience to participate in the film's "challenge," an equivalent to those chain letters that claimed if you didn’t forward the email to 10 people something terrible would happen to you. Many complied. "Are YOU up for the challenge?" asks the Facebook page. "Text 'God’s Not Dead' to 10 friends RIGHT NOW! Then leave a comment below!" 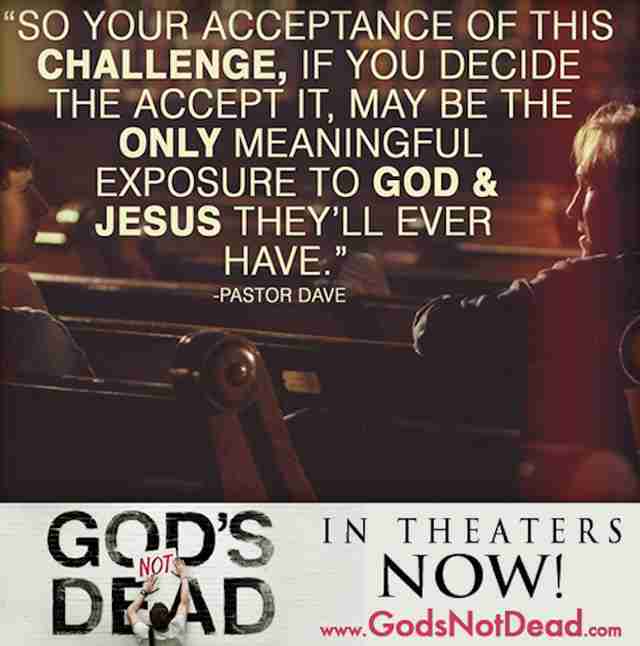 The image that accompanies the challenge includes this quotation from the movie's cheeriest Christian character, Pastor Dave: "So your acceptance of this challenge, if you decide the [sic] accept it, may be the only meaningful exposure to God & Jesus they’ll ever have." I'm not going to text "God’s not dead" to 10 friends RIGHT NOW, especially since nobody, not even Nietzsche (or even Lex Luthor) is suggesting his corpse is actually out there somewhere. I don’t believe receiving a text message about God’s not-deadness constitutes meaningful exposure to God and Jesus. I'll have a conversation with a friend over coffee or beer about how faith and doubt go together, or answer questions about my church, sure. On the other hand, RIGHT NOW I might just text a friend and ask how they’re doing. Or maybe today I’ll just share a picture of a sloth in a fedora. Ultimately, what the increasingly profitable "faith film" industry machine wants to do is sell me an idea of what "taking a stand" for Jesus looks like. That involves buying a ticket, sharing a Facebook meme, going to a concert, and texting a bastardization of a late 19th-century philosophical proclamation about the bleak condition into which we humans have painted ourselves to 10 people RIGHT NOW. It's arguing with your professor and being certain you're right. It's "supporting" a movie for its message, and definitely not criticizing it when it fails to be a good movie (though when an atheist makes a respectful but somewhat fanciful film based on a Biblical story, look out). The part that leaves me angry, and why I'm more frustrated with any bad Christian movie than the commercial manipulation of sour blockbusters like Batman v Superman or Jurassic World, is that Christians live within a system of belief and practice that is meant primarily to be a blessing to people outside the church walls. It is a basic article of Christian belief that all people bear God's image. We are to exercise the same boundless imagination and creativity that he does. Christians, of all people, ought to push hard against people who try to sell a fear-mongering, illogical, politically driven version of Christianity, where the goal is for your team to win, to prove you're right. And Christians ought to especially value exploration and truth-seeking, wherever it's found. We ought to be making fabulous movies that raise religious questions: who are we? Why are we? Where did we come from? Where are we going? What should we do while we're here? And since Christians believe in God’s very aliveness -- since our theology suggests that people don't save others' souls, God does -- and since we don't have anything to lose, we shouldn't think we have to swoop in and answer the question before the credits roll. Christians feel spoofed in the media because they have been. But feeling caricatured shouldn't lead to more caricaturing. Instead, we need broader imaginations. In pursuit of better writing, we need more depictions of complicated, interesting Christian characters in our media like the ones we see on The Americans and Jane the Virgin and Rectify, in Calvary and Selma. We need media that explores difficult, complicated matters of belief, like Midnight Special and The Leftovers. 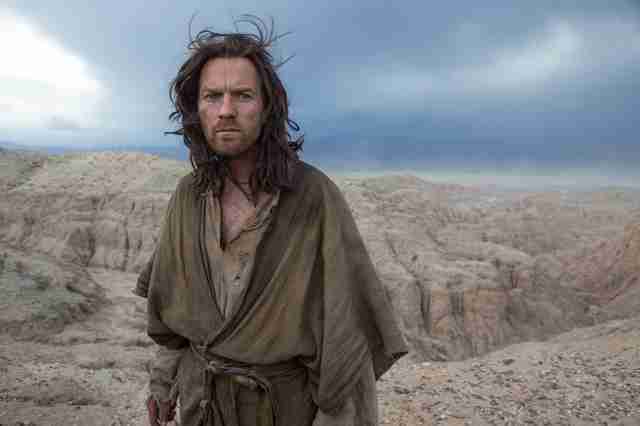 We need serious movies about Christian faith; Last Days in the Desert and The Innocents, both en route in 2016, are terrific examples. God’s Not Dead 2 comes out this Friday, and I’ll be there. I’ll walk into that theater with all this baggage, and also with a huge sense of hope. One of these days, a film is going to surprise me. But until then, I’ll still be frustrated. "Christian" shouldn’t mean "safe." "Faith-based" shouldn’t mean "ham-fisted." Audiences shouldn't expect to leave the theater comfortable. Movies should change our lives and expand our imaginations. If it just reinforces our prejudices and lines in the sand, then it’s just a feature-length infomercial. And nobody, especially not America in 2016, needs more of that. Alissa Wilkinson is critic at large for Christianity Today, an assistant professor of English and humanities at The King's College in New York City, and usually a pretty sunny cinematic omnivore. Follow her weeks-late TV tweets and exhausted festival updates at @alissamarie.